Weatherization involves a wide range of improvements that protect a building and its interior from the weather. Proper weatherization details enable you to stay comfortable inside your home no matter what weather conditions prevail outside. One part of weatherization work involves stopping water leakage. Water leaks occur in predictable places and they’re easy to spot. Air leaks are trickier to locate. Although we can’t usually see air leakage points, we can certainly feel their effects –in the form of cold, drafty rooms during winter weather and interior “hot spots” during the summer. Air leaks cause financial as well as physical discomfort because they have a huge impact on utility expenses. With too much "conditioned" (heated or cooled) air leaking out of the house and too much outside air leaking in, your HVAC system has to work harder and longer than necessary to maintain comfortable interior temperatures. Since nearly half of your total utility expenses go to heating and cooling, air leaks are costly. We offer weatherization services in Bridgeport, New Haven, Hartford and nearby. Call us today to schedule a free estimate! 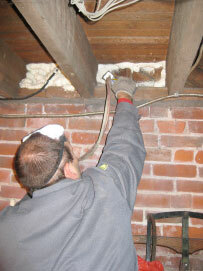 Inadequate insulation is another major energy leak found in most houses. Without adequate insulation, too much heat escapes from you living space during cold weather and too much heat enters the house when it’s hot outside. If you’re getting the idea that weatherization can encompass a large variety of work on your house, you’re absolutely right. To avoid confusion about which weatherization improvements are most important, many homeowners are having energy audits performed on their houses. A complete home energy audit should include specific recommendations for weatherization improvements that will save you money while improving your interior comfort. The audit may include other recommendations as well –like replacing an inefficient water heater, for example. But weatherization improvements usually take top priority because they are “once-and-done” improvements that are affordable and very effective at saving energy and money.